The New National Pastime Theater presents, back by popular demand, 2200 years in the making, here to fill the holiday vOY-OY-OYd!, the only rock ‘n’ roll Hannukah musical on earth, HANNUKATZ THE MUSICAL! Family-friendly and the perfect first-date ice-breaker! This is not your grandma’s Jewish Christmas – or anyone else’s for that matter. 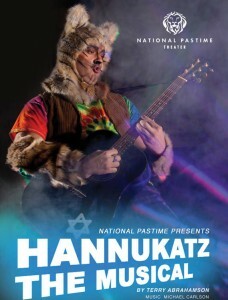 Inspired by Terry Abrahamson’s best-selling, HANNUKATZ SAVES HANNUKAH, HANNUKATZ THE MUSICAL! is recommended for those who celebrate Hannukah and those who don’t. Performances begin November 30th and run through December 30th. 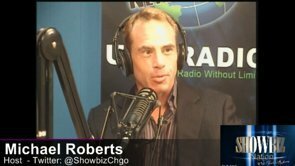 Shows are Fridays and Saturdays at 8pm with Saturday and Sunday 3pm matinees. Tickets are $25. Kids 12 and under are $10. Tickets can be purchased athttp://hannukatz.brownpapertickets.com or the box office at 773-327-7077. Call for group discounts on parties of ten or more. NPT welcomes Bailiwick Chicago to our new Uptown locations presenting the Chicago premier of BLOODY BLOODY ANDREW JACKSON. In BLOODY BLOODY ANDREW JACKSON, we follow the story of America’s first political maverick. An exhilarating and white-knuckled look at one of our nation’s founding rock stars, the musical recreates and reinvents the life of “Old Hickory,” from his humble beginnings to his days as our seventh Commander-in-Chief. It also asks the question: is wanting to have a beer with someone reason enough to elect him? What if he’s really, really hot? Performances are October 4th through November 10th. Thursdays through Saturdays at 8pm and Sundays at 6pm. Press opening is Monday, October 8that 7:30pm. Tickets are available at bailiwickchicago.com. Art for Keeps: a fundraising exhibition featuring a collection of vibrant paintings by talented artist Audberto Velez. Audberto is passionate about creating and painting live art at events. His works are colorful and energetic showcasing the faces of humanity. Four years ago, Velez moved to Chicago from Puerto Rico to follow his dream of reaching a higher level of artistic expression. Purchase a piece from the Art for Keeps collection you will be get a piece of Audburto’s soul in your space. Proceeds from this exhibition will help him survive the months following his upcoming hip replacement surgery. Art for Keeps exhibition runs alongside the Bailiwick Chicago Theater musical Premiere of Bloody Bloody Andrew Jackson also at the National Pastime Theater. Art for Keeps fundraising exhibit is curated by Christine Brown from Unieros. To view samples of Audberto Velez’s work go to www.unieros.com and scroll down.